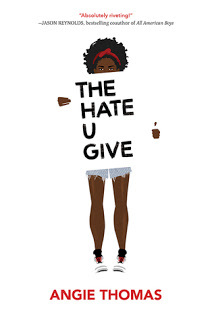 Welcome to week three of discussion and challenges for THE HATE U GIVE by Angie Thomas! CHAPTER 13: We learn more details on Khalil's decisions and current circumstances. Knowing this extra information, does it change how you view him? CHAPTER 14: Comment on this quote. CHAPTER 15: Let's talk about the friendship between Starr and Hailey. It seems to be on edge, even before the death of Khalil. Starr's mama recommends she makes a list of pros and cons. What do you think Starr will discover if and when she makes this list? CHAPTER 16: Starr is being interviewed for a TV special. The chapter ends with her final blow, and it was the first time her parents have heard some of the details she discloses. What did you think of the interview as well as the potential reactions to those listening? CHAPTER 17: The big dance has arrived, but it does not get off on a good foot between Starr and Chris. Comment on the night's events. CHAPTER 18: The night before her appearance in front of the grand jury, Starr's home is targeted by a drive-by shooting. Who do you think was behind this violence? Why? Starr's mom leaves her with this advice before she enters the grand jury room. Do you think Starr was able to internalize this message? Reading can help build empathy and take readers into the shoes of those different from themselves. Find a favorite book that will take a reader into a world unbeknownst to them and pass it on to a friend or stranger. Next week, we will be chatting about the remainder of the book. Don't forget to share your thoughts, comments, and challenges using the hashtag #12mos12rals! Can there be alittle more quotes from the book "The Hate U Give"
Join Us For THE HATE U GIVE and a Challenge!